This pizza recipe from Vermont features using your BBQ Grill. Try this delicious Vegetable and Cheese Pizza Recipe from Cabot Creamery. Ask us about Cabot recipes or share comments. Feature your business, contact VTLiving. Using barbecue grill, allow coals to turn to gray ash, or turn gas grill to medium setting. Mix olive oil and garlic. Place vegetables on grill, brush with olive oil mixture, and grill for 10 minutes or until lightly browned and cooked, turning frequently. Remove from grill, cool slightly, and cut into 1/2″ pieces. Place pizza crusts on grill, top side down and grill 3-5 minutes until warm. Remove from grill and spread each crust with 1 tsp. pesto sauce, 1/2 cup cheese and 1/4 of the vegetables. Top each pizza with 1 tablespoon cheese. Return pizzas to grill and cook until crisp and cheese is melted. Cut each pizza into 6 portions and serve. 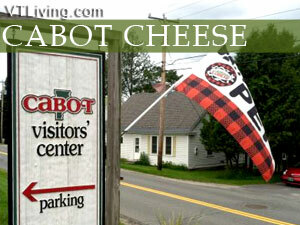 Visit “The World’s Best Cheddar” to read more about Cabot Creamery.